Swedish tenor Niklas Björling Rygert has during the last couple of years established himself as one of Scandinavia’s leading spiel/character tenors. He received his musical education at the NBV Theater Workshop, Opera Studio 67 and The University Collage of Opera, all in Stockholm. As a child Niklas Björling Rygert was frequently engaged as actor in the many departments of the theatre world, such as performing in the “Folkan” theatre in Stockholm and doing voice overs in Walt Disney movies. He made his debut as an opera singer in 1994 at the Bergslagenoperan in Sweden, where he sang Spinkel in The Merry Wives of Windsor. 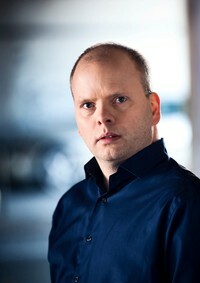 In 1999 Niklas Björling Rygert joined the ensemble at the Royal Swedish Opera in Stockholm where he has performed roles such as Mime both in Das Rheingold and Siegfried, Monostatos in Die Zauberflöte, Dickson in La dame blanche, Belfiore in La finta giardiniera, Goro in Madame Butterfly, Remendado in Carmen, Franz/Andrés/Spalanzani/Pitichinaccio in Les Contes d´Hoffmann, Vasek in The Bartered Bride, Spoletta in Tosca and Don Curzio in Le Nozze di Figaro. At the Folkoperan in Stockholm he has sung Pedrillo in Die Entführung aus dem Serail, and Arturo in Lucia di Lammermoor. He has also sung Poulenc’s La Voix humaine in the Culture House in Stockholm. Niklas Björling Rygert has received the Operafriend´s award (2003) and the Masonic Order´s master education grant (2005). Other important engagements include Niklas Björling Rygert’s German debut as Der Narr in Der Schatzgräber with the Frankfurt Opera, Mime in Das Rheingold with Kent Nagano and The Gothenburg Symphony Orchestra, Pedrillo in Die Entführung at Dresden’s Semperoper andMime at the Royal Opera in Stockholm as well as at Palau de les Arts Reina Sofia, in Valencia.